In order for Mailtraq to be your mail server (and also to serve webmail and allow external users to access the server) for your organization you have to tell the Internet world 'who you are' and 'where you are'. When you register your domain name, you also get several 'records' which tell Internet traffic how to locate your servers. Your 'A-record' for 'www.' holds the IP address of your website. Your 'MX-record' (MX stands for 'mail exchange') says where your mail server is located. You must check that your ISP allows traffic on Port 25. Business Internet connections normally have Port 25 open, but if you are transitioning a SO-HO or home use account you must confirm this is open. Port 25 is the route messages take to the Internet so it is essential it is open. You can use Telnet to check this yourself, using Port 25. If your email is currently being handled by someone else - commonly your ISP - you will need to tell the domain name registrar (where you registered your domain) to change your MX record to point to the Mailtraq machine. You can often do this yourself. For technical reasons, an MX-record has to point to a domain, and then that domain points to the IP-address. So, typically you set the MX-record to point to to a sub-domain you create yourself, for example - mail.example.com and then set mail.example.com to point to the public IP-address of your router. We explain how to do this below. Changes do not happen instantly. DNS record changes typically take 24-48 hours to promulgate. You can check that your MX record is correct by using a public checking service such as www.intodns.com or using NSLookup on your own machine. Meanwhile, do not stop your current POP3 collection from your ISP (or other mail host) - so that no messages get missed. Once you are confident that all mail is being routed direct by SMTP then you can stop the POP3 collection - waiting a few days is good. If you connect to the Internet via a router - and most people do - then you will need to configure port forwarding or NAT to route traffic for certain ports to the Mailtraq machine. You may also need to open any firewalls on these ports. Don't worry about network security on these port forwards - Mailtraq provides an internal firewall to protect your local network. You register your domain with a Domain Registrar. This may be your ISP, but is more often a company who specializes in domain registration - there are many to choose from (click to see). Nearly all Registrars allow you change your own settings using some sort of 'console'. The setting changes you need to make are simple - you need to set the A-Record for your mail DNS-host to the Public Facing IP Address of your Internet connection. Your ISP will have told you that when you signed up, and it is probably on your billing statement, but you can use the tool in this box to check at any time. You must test from a browser on the actual machine you have installed Mailtraq onto. What is my Public Facing IP Address? Use this link from the Mailtraq machine itself. mail.example.com must point to the Public Facing IP Address of the machine that Mailtraq is installed onto. Second - the MX-Record must be set to point to the sub-domain you just created. Once you know your Public Facing IP address, go to your account at your Domain Registrar and select the 'Total DNS Control' or 'DNS Manager' option. It may be called something slightly different, but you need to see a dialog similar to the one below. Do not confuse this with 'Domain Forwarding' or 'Frame-set Redirect' which may be other options. 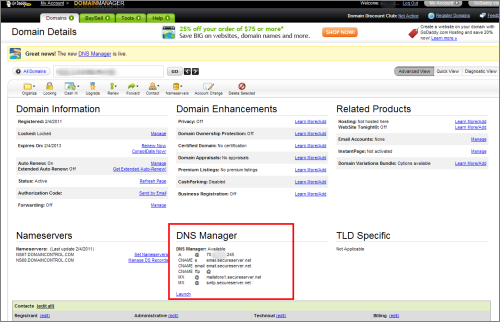 This is an example from GoDaddy - a popular Registrar. You need to use a mail A-record as well as the host name 'www' . In the above example the 'www' has been set to the catch-all '@' which 'Points-to' 68.178.232.100 That is the IP address of the server hosting the website for the domain. Then, use the 'Quick Add' (or equivalent) button to add a 'mail' entry in the 'A' (Host) section - and 'Save Host File'. This is necessary because MX should not point to C-Names. That is the IP Address of the machine that Mailtraq is installed onto. Go the the MX Section of the DNS Manager and change the settings so that the MX Points to the host you created previously. In this example the MX-Record points to mail.example.com which in turn points to 70.88.251.245 which is the public facing IP address of the machine hosting Mailtraq. Strictly speaking in many cases you don't need an A-Record to access Mailtraq from 'outside'. If you know the IP address you can use that instead. You cannot receive messages from the Internet however unless you set a relationship between your IP address and your domain using the MX record in the DNS system explained above.